Encouraged by discussions with some in the fledgling Baer’s Pochard Task Force, this second post follows on from the one last month on Baer’s Pochard Aythya baeri identification. The March post outlined some main features to look for and highlighted some major information gaps, including the identification of some females and especially immatures. Many information gaps remain. However, thanks to Choi Chul-Soon and Rich Lindie in the ROK, Pete Morris and Marcus Nash in the UK, Neil Davidson and Yann Muzika in Japan, and Terry Townshend in China this post includes several new images and some additional insights, aimed at trying to ask and answer a few more questions. First though, a correction to the March post: a series of stunning images (photographed in Japan by Neil Davidson, and featured on his excellent blog) taken on December 1st and then again on December 21st confirms that male Baer’s Pochard can have much of the green on the head obscured by brown into December. A late progression out of eclipse plumage is also suggested by some captive Baer’s type birds in the UK (Marcus Nash in lit., April 2015). Brown, but not orange or chestnut, on the head in a bird in late autumn that otherwise has all the features typical of male Baer’s is within the normal range of Baer’s Pochard. 1.What to consider as likely hybrid features? 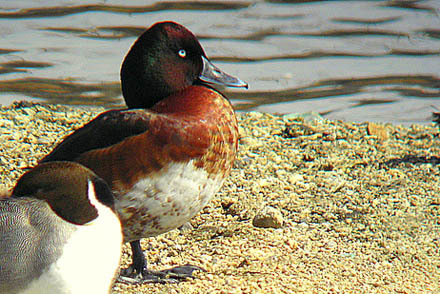 A paper in British Birds on the identification of Ferruginous Pochard (Vinicombe 2000) concluded that, “An apparent Ferruginous Duck Aythya nyroca should always be checked for signs of hybridity and, if it shows any anomalous feature, no matter how small, it should not be claimed as such”. Considering the extreme global rarity of the Critically Endangered Baer’s Pochard, it only seems appropriate to apply a similarly strict approach to all claims of Baer’s Pochard (until, as above, research demonstrates that suspected anomalies are instead part of the normal variation shown by pure birds). It is important to note that many of the presumed anomalies listed above are evident both in images of wild birds and in many of the Baer’s held in captivity. It is therefore hoped that genetic testing of captive birds might soon help to disentangle which of these anomalous features, if any, can be shown by pure birds and which are instead the result of hybridisation. 2. 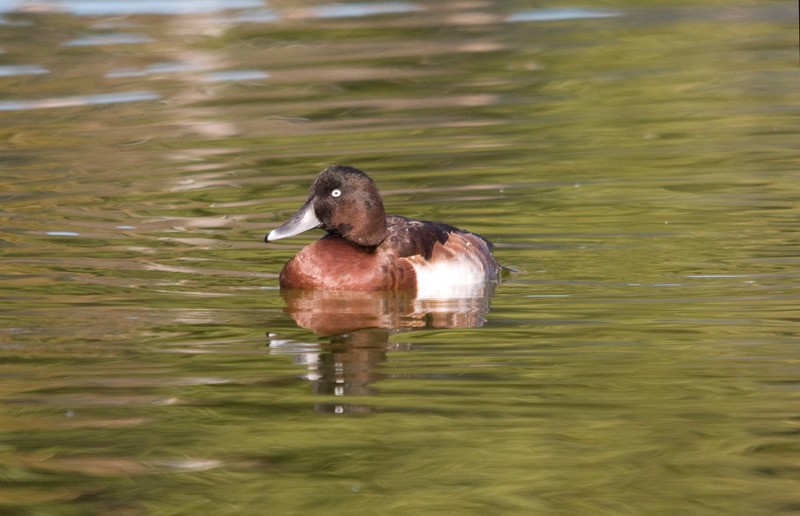 Is there really any evidence that Baer’s Pochard hybridises with other Aythya? Several species have been documented as hybridising with Baer’s Pochard in captivity (see: Handbook of Avian Hybrids of the World). Although there are very few Anatidae collections still in East Asia (fortunately! 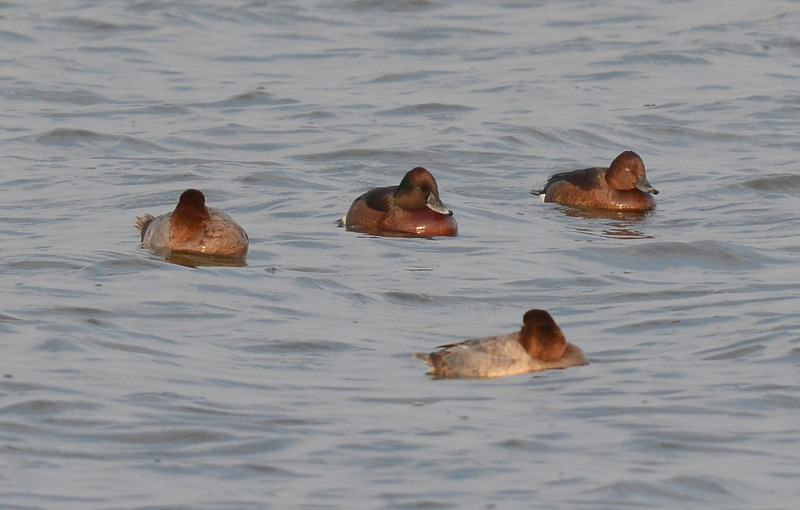 ), there have been several observations of Ferruginous Duck seen displaying to Baer’s Pochard (at least once in the ROK and more often in China). 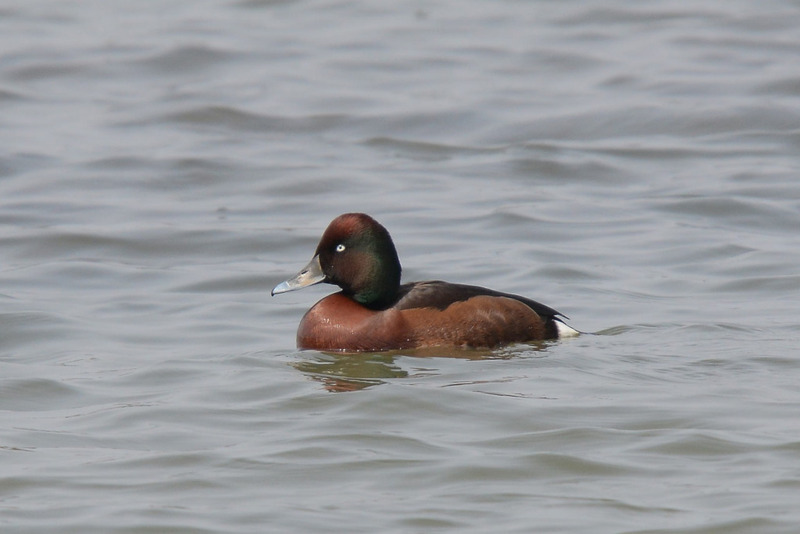 And a quite beautiful male Aythya photographed in Gangneung by Choi Chul-Soon at the end of March 2015 appears to show multiple features of both Ferruginous Duck and Baer’s Pochard. The male can be aged as an adult (or much less likely adult-type) based on its extremely pale iris and lack of mottling on the breast. It shows an extensive green gloss to the rear of the head (apparently unlike Ferruginous at any age); has a subtly darker breast than flanks; and lacks any hint of a white fore-flank patch. In the lower of the two images, it looks more or less similar in size to two Common Pochard, and similar in structure to the female Ferruginous Duck (which was identified as a pure bird by Marcus Nash), though with a thicker neck and more blocky head. 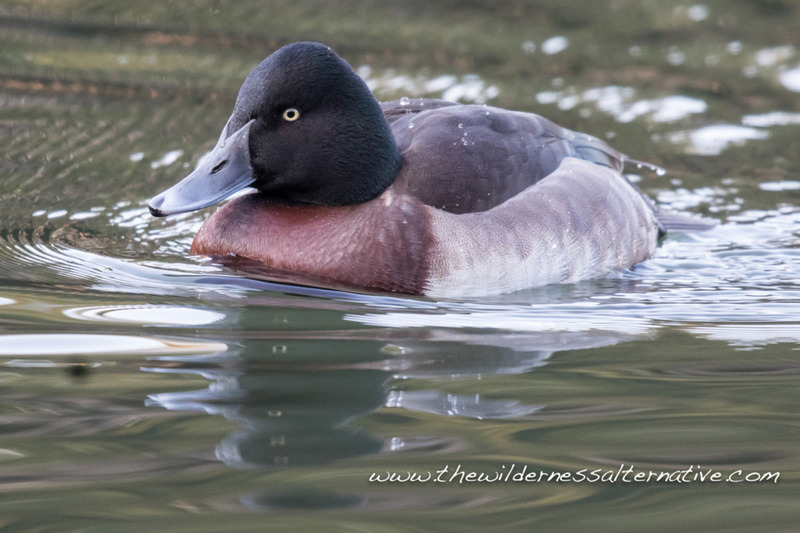 As the male at least shows features considered diagnostic of two species, the most obvious identification of this bird is as a male Baer’s Pochard x Ferruginous Duck hybrid. The March 2015 individual is sadly not unique in appearance. Rather, it closely resembles a male photographed in Gyeonggi Province in January 2006, shown on page 74 of the excellent “Wild Birds Field Guide” (Park 2014), differing from pure Baer’s Pochard in having rufous-tones to the crown; in having a greatly reduced white fore-flank patch (not reaching the dark of the upperparts, but still more obvious than the 2015 bird); and in having rear flanks that are extensively saturated with a Ferruginous Duck-like reddish brown (lacking obvious pale-based tiger stripes). Both the 2006 and 2015 individuals are in turn quite similar to (but much cleaner-looking than) a male that was photographed in Seoul in March 2007, and was present at least from the beginning of the month to the 23rd. This 2007 bird, posted on the Birds Korea website, showed mottling on the breast and rufous-brown spots on the belly, indicative of immaturity. 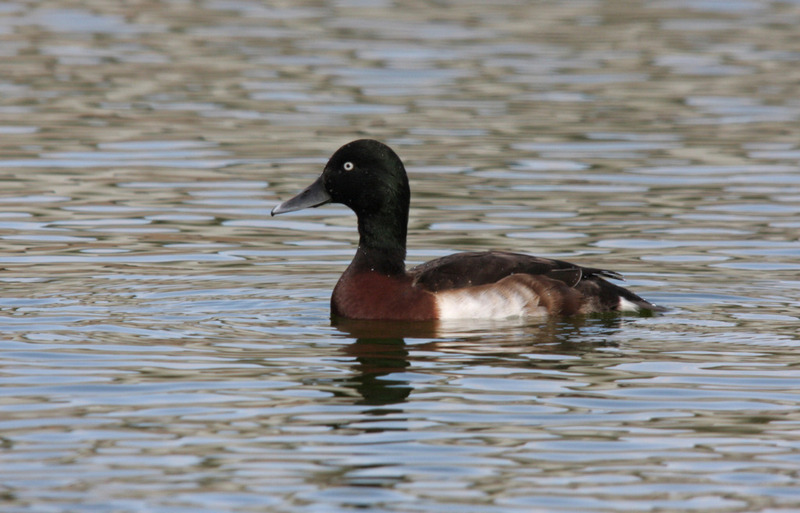 The most reasonable identification is therefore as a First-winter male Ferruginous Duck x Baer’s Pochard hybrid. These three individuals are perhaps (?) First-generation hybrid males (with one parent Ferruginous and one parent Baer’s Pochard). Second-generation hybrids between Ferruginous and Baer’s are likely even more challenging to identify. A bird photographed at Yancheng (north of Rudong on the Chinese coast) in December 2014 was initially identified confidently by the observers as a First-winter Baer’s Pochard. However, it seems to myself and some others to show multiple anomalies (including in structure and plumage). It does show a slightly paler lower fore-flank at some angles, apparently most obvious on the left side of the bird; the bill does looks pale and fairly large; and the head might show some faint greenish gloss, all suggestive of some Baer’s influence. However, the fore-flank white is greatly reduced; there is little contrast evident in the images between the head and the breast; the flanks look fairly uniform (with Ferruginous-like striping); and the scapulars show obvious paling (a feature apparently shown by some Ferruginous x Common Pochard hybrids, according to Vinicombe’s paper). At least some Baer’s Pochard aged as First-winter in mid-winter look close to adult Baer’s Pochard, and therefore seem quite unlike this bird. And of course, age does not explain any structural anomalies. Useful correspondence with the photographer (on April 9th and 10th) included the comment that although this bird looks similar to other online images of Baer’s, that the identification might best be withdrawn, unless / until other First-winter Baer’s Pochards are shown to lack white on the fore-flanks and green on the head. A different bird photographed at Song Do, Incheon, in November 2012, helps to suggests some of the potential challenges of identifying pure Baer’s Pochard based on online images and information. The Song Do bird was also initially identified as a First-winter Baer’s, with this record included in the 2013 paper written by Hearn et al. in BirdingAsia 19 (2013) 63-67. According to the paper, ageing of this and a second individual in China was based on its relatively dull plumage and dark eye (although the images show the Song Do bird was pale-eyed). Apparently, this bird remained for another two months or more and did not develop any green on the head, nor any extensive white on the fore-flank. It was instead reluctantly identified as a hybrid (perhaps Second-generation) by several observers. Even the captive male (photographed by Pete Morris at Martin Mere in the UK), used in the March blog-post to demonstrate the plumage of pure Baer’s Pochard and posted again below, seems to show some subtle anomalies that might suggest a history with some hybridisation in it. Captive Baer’s Pochard or Baer’s type, Martin Mere, UK, March 2015 © Pete Morris. Several other wild Baer’s Pochard-like individuals and more obvious hybrids suggest the influence of Common Pochard (either First Generation hybrids or backcrossed with either of the parent species). Such males e.g. show some green on the head; some white on the fore-flank; and some hint of “tiger-striping” on the flanks. They can also show some trace of orange on the crown and some grey or vermiculations on the flanks or on the upperparts (neither of the latter feature being found in either pure Baer’s Pochard or Ferruginous Duck). A hybrid male Aythya was photographed in Busan on March 15th 2003. First picked up at very long range on account of what appeared at rest to be deep green gloss to the head, reddish-brown breast, white fore-flank spur, weak tiger stripes on the flanks, and white vent, the bird was large, similar in size to Common Pochard. It also showed extensive vermiculated grey on the flanks; and upperparts that paled from dark grey to pale grey, all features that clearly indicated a hybrid origin, as did the purpley-green gloss to the head in strong light. Although the bill looked fairly Baer’s like, this bird had a wing-stripe that was strikingly white on the inner part of the wing and obviously grey on the outer wing. It was therefore tentatively identified and posted as a hybrid Baer’s Pochard x Common Pochard (either First or perhaps Second Generation? ), an identification it seems that was incorporated into The Handbook of Avian Hybrids of the World (see p. 91). A male photographed in Japan (on February 28th 2015) also seems to be the result of hybridization between Baer’s Pochard and Common Pochard. 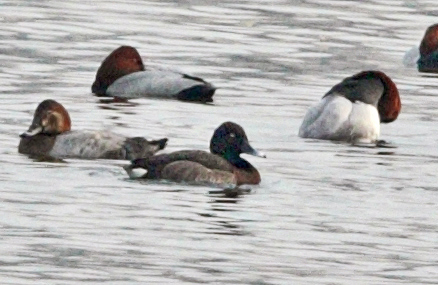 The series of images seem to show a bird similar in size to a Common Pochard (thus towards the large-end for a Baer’s, like the March 2015 bird in Seoul), with a large head and pale bill (both good for Baer’s Pochard); a reddish-brown breast; and a strong green gloss to the rear of the head. 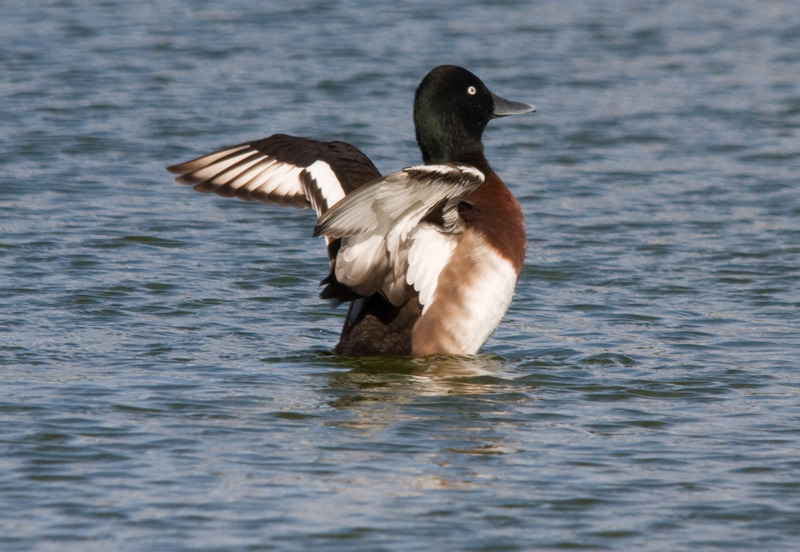 Although the flanks show some weak tiger-striping, they are covered with grey vermiculations (giving the flanks a coarse-grained look), recalling Common Pochard. Common Pochard is also strongly suggested by the orangey-brown tones to the crown. 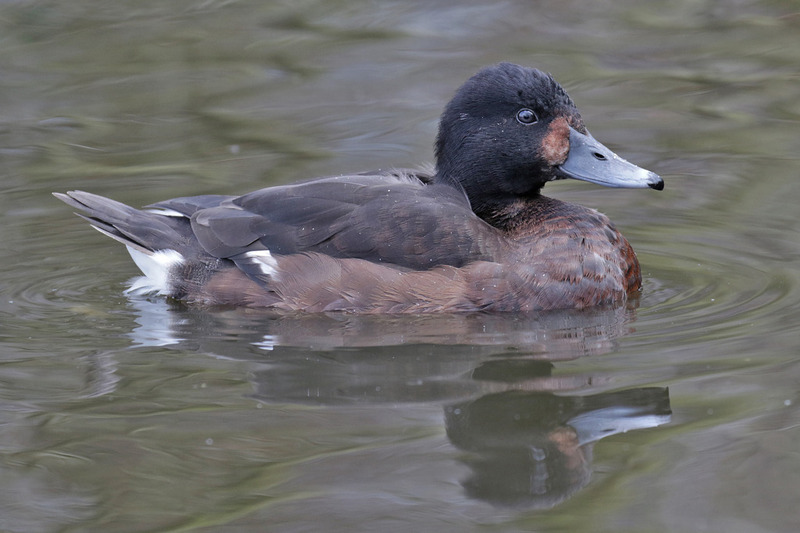 A different male in Tokyo, well-photographed in January 2015 by Yann Muzika and others, superficially looks much closer to a pure Baer’s Pochard, and has been posted as such on the Oriental Bird Club Image Database. However, thanks to the exceptional quality of the images, fine vermiculations can be seen across part of the fore-flank (especially on the left side of the bird); a hint of orange is present on the fore-crown (see lower image); and the eye is more obviously yellow than might be expected in a pure Baer’s. 3. All of the (presumed) hybrids described above have been males: what do female hybrids between Baer’s Pochard and other species look like? Can they be identified with confidence? We welcome your input with helping to answer this important question(!). Although there seems to be a high prevalence of male Baer’s types that show “obvious” hybrid features, during 25 years of fieldwork within region and a decade of trying to help Birds Korea review records of Baer’s Pochard and Ferruginous Duck in the ROK, I do not remember knowingly seeing any image of a female Baer’s Pochard-type identified here as a hybrid. Allowing for obvious sources of bias (with females being both harder to identify and less attractive to photographers), it still seems reasonable to ask why so few female Baer’s and Baer’s like birds are being claimed, and why no such birds are being identified as having anomalous features. Are some of those females that are getting photographed on the breeding grounds, some of which seem to show a Baer’s-like structure and a Ferruginous-like plumage, all Baer’s Pochard in a poorly-known plumage? Or are some of these more likely to be hybrids? Until the results of the genetics work being conducted on captive Baer’s Pochard are published by the WWT, at the least it seems unwise for now to identify Baer’s Pochard on the basis of comparison with captive birds in Europe, where many birds sadly do appear like they may have been affected by hybridisation (Marcus Nash in lit. April 2015). Female Baer’s type, March 15th 2015, Martin Mere (UK) © Pete Morris. Note e.g. the grey and black vermiculations close to the vent, and the lack of white fore-flank patch and tiger-striping. 4. And finally, are these East Asian hybrid-types from bird collections? Unlike northern Europe and some other regions of the world, it appears that happily there are still very few Anatidae held in collections in the ROK; and still only a few records of escaped or released exotic waterbirds (including e.g. Black Swan). Although there seem to be no (?) well-documented reports yet of mixed pairs with young, there are multiple threads of evidence that support the hypothesis that hybridisation in the wild between Baer’s Pochard, Ferruginous Duck and Common Pochard is taking place. Multiple presumed hybrids are being seen (in recent years outnumbering apparently pure Baer’s Pochard in the ROK). 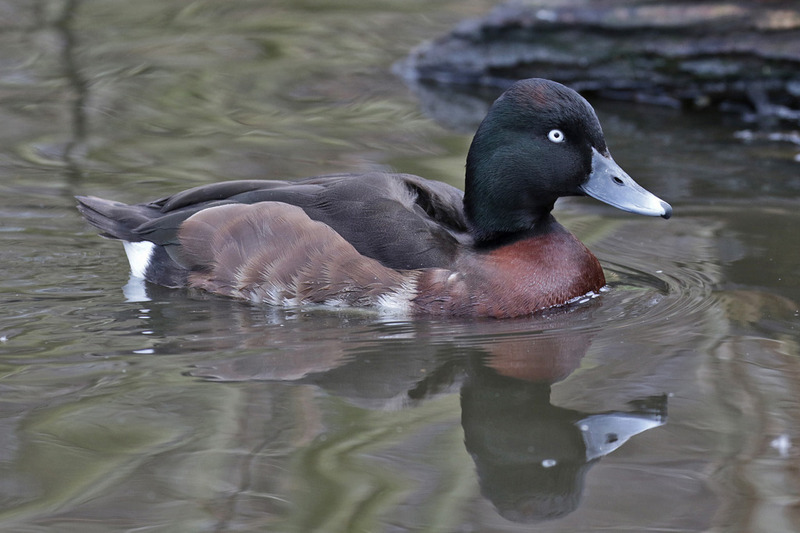 And while Baer’s Pochard has undergone a massive decline, Ferruginous Duck, a species mapped as breeding in several parts of China in Cheng’s Synposis of the Avifauna of China, continues to expand northeastward into the core of the breeding range of Baer’s. Common Pochard too was, until recently at least, also increasing within part of the breeding range of Baer’s Pochard. 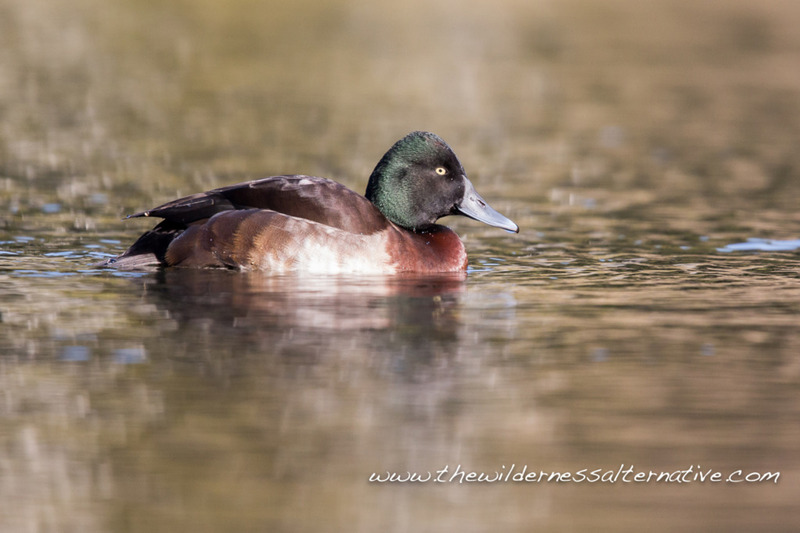 To help improve this discussion, please, we would like to ask respectfully if birders in Japan, China and Russia can confirm whether you know of captive Aythya and wild bird collections that include Baer’s Pochard and Ferruginous Duck? And / or whether you know of (likely) mixed pairings of wild birds at breeding sites? If so, can you please send us or the WWT (latter, as coordinators of the Task Force) details, if possible with images? Also, please send any corrections or thoughts, either privately or publicly in the comments section. Thank you! And again, thanks once more too to all those who helped with this note in one way or another: Mr. Choi Chul-Soon, Dr. Shim Kyu-Sik, Prof. Robin Newlin, Mr. Tim Edelsten, Mr. Rich Lindie, Mr. Terry Townshend, Mr. Pete Morris, Mr. Marcus Nash, Mr. Neil Davidson and Mr. Yann Muzika. 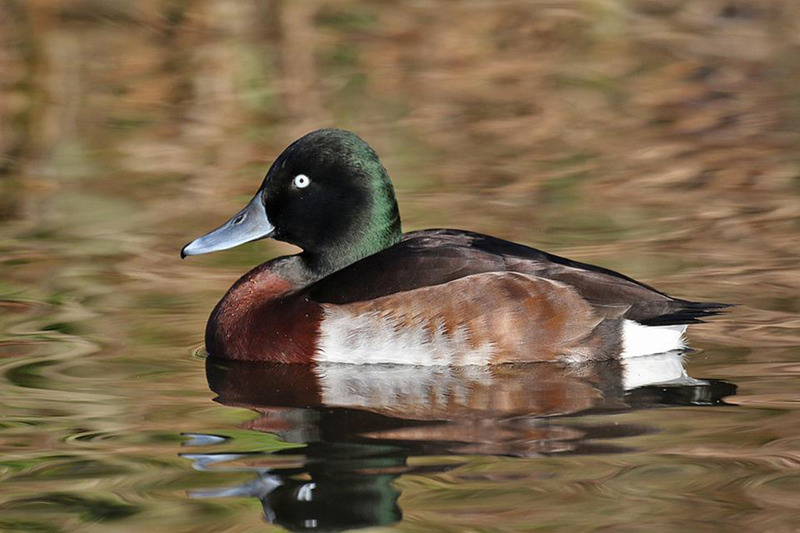 To find out more information about Baer’s Pochard, please click HERE.